Today is Monday, and we start the week with a fascinating topic: Oily hair. Hair oiliness is a problem that affects a large part of the population around the world, but nobody suffers as much as women do. One of the most common complaints is to wear the scalp with excessive shine, dandruff, and itching. Not counting the look left that gives us the feeling of having hair stuck to your head because of excess fat, right girls? It is a hair that is washed in the morning, and at the end of the day, it arrives without volume. Washing the hair with water at the correct temperature is essential for the health of our hair. 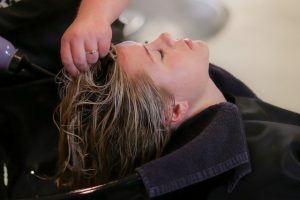 The boiling water attacks the scalp stimulating the sebaceous glands to work more to protect it from that aggression and when they work more, the production of oil increases. Contrary to what many believe or have believed, oily hair should not be washed daily, washing them every other day is enough. The shampoos for oily hair should not always be used; they cause the same effect of hot water: dry scalp and stimulates the sebaceous glands to produce more oil to hydrate the hair fiber. You can alternate the washes using once a shampoo for oily hair and again a neutral shampoo with balanced PH. Astringent shampoos should be used preferably when our hair is filthy at most twice a week. Girls, it is essential that you remember that the use of the conditioner on the scalp is not recommended. The product must be applied directly on the hands and spread from medium to ends and finish rinsing well to leave no residue. Eliminate products of type 2 in 1 (shampoo + conditioner), and mainly creams without cleaning. Did you know that nutrition directly influences hair fat? Consumption more than carbohydrates, milk derivatives, and fatty foods can aggravate the problem. Therefore, choose a balanced diet, including fruits, vegetables and vegetables and eliminating fatty foods and fried foods. No study demonstrates that the use of these devices increases the hair’s oiliness. Ideally, the hair should be dried naturally, but if you do not want to quit using the dryer, keep it far from your head at least 15 cm so that the heat does not stimulate the sebaceous glands. Remember to apply thermo-active products that protect our hair from intense heat. Running your hands through your hair playing with him from one side to another can be a charm and even a hobby, but if you have oily hair, avoid doing it. Wearing hats and scarves often also increases hair grease. This happens because the scalp ends up being suffocated, thus increasing the natural production of oil. If you already have oily hair, avoid the frequent use of hats, handkerchiefs and any other accessory that can suffocate the scalp. If you got oily hair, you should avoid products that do not rinse, such as waxes, ointments, combs, silicones and excess oils. To model the nose, it is preferable to use gel and mousse. You can also use leave-in by applying only the hair medium to the tips to protect the hair against excess pollution and ultraviolet rays.